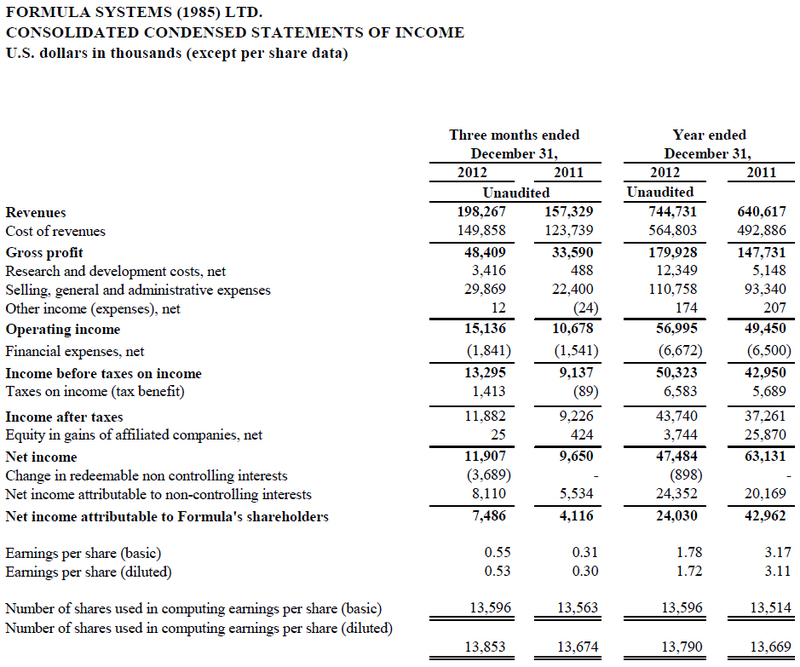 Or Yehuda, Israel, March 14, 2013 – Formula Systems (1985) Ltd. (NASDAQ: FORTY) a leading provider of software consulting services, computer-based business solutions, and proprietary software products, today announced its results for the fourth quarter and full year of 2012. Revenues for the year ended December 31, 2012, increased 16% to $744.7 million compared to $640.6 million in the year ended December 31, 2011. Operating income for the year ended December 31, 2012, increased 15% to $57.0 million compared to $49.5 million in the year ended December 31, 2011. Non-GAAP operating income for the year ended December 31, 2012, increased 29% to $72.8 million compared to $56.4 million in the year ended December 31, 2011. Net income for the year ended December 31, 2012, increased 40% to $24.0 million, or $1.72 per fully diluted share, compared to $17.2 million, or $1.3 per fully diluted share, in the year ended December 31, 2011, excluding income of $25.8 million recorded in the year ended December 31, 2011 in connection with the acquisition by Sapiens International Corporation N.V. of IDIT I.D.I Technologies Ltd and FIS Software Ltd. Non-GAAP net income for the year ended December 31, 2012, increased 49% to $32.0 million compared to $21.6 million in the year ended December 31, 2011, excluding $25.8 million recorded in the year ended December 31, 2011 in connection with the foregoing acquisition by Sapiens. Consolidated cash and short term and long term investments in marketable securities totaled approximately $126.4 million as of December 31, 2012. 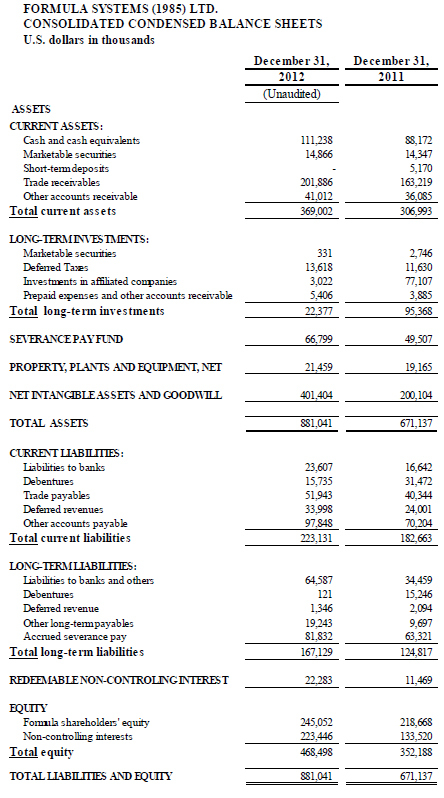 Total equity on December 31, 2012 was $468.5 million (representing 53% of the total balance sheet). Revenues for the fourth quarter ended December 31, 2012, increased 26% to $198.3 million compared to $157.3 million in the same period of 2011. Net income for the fourth quarter ended December 31, 2012, increased 82% to $7.5 million, or $0.53 per fully diluted share, compared to $4.1 million, or $0.30 per fully diluted share, in the same period of 2011. 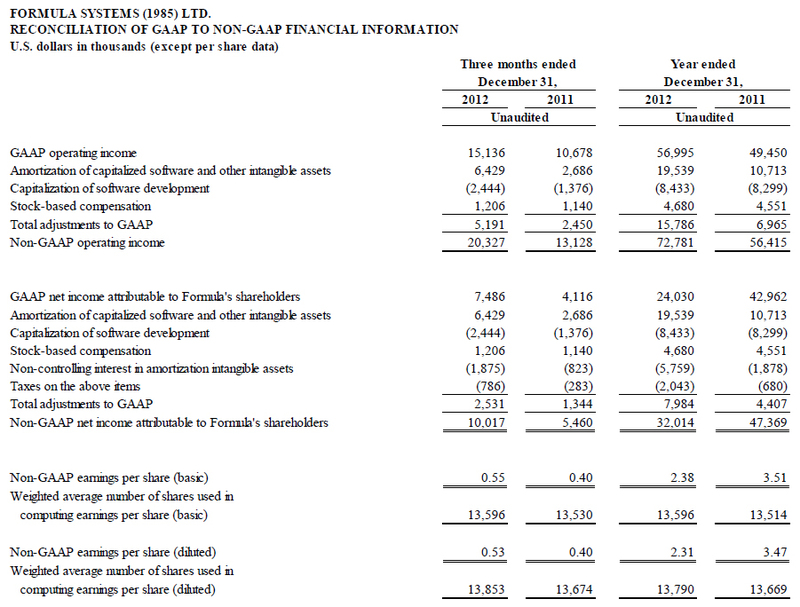 Non-GAAP net income for the fourth quarter ended December 31, 2012, increased 83% to $10.0 million compared to $5.5 million in the same period of 2011. “Looking forward, We believe that we are well positioned to continue our growth track in 2013” concluded Bernstein. Formula’s management believes that the purpose of such adjustments is to give an indication of Formula’s performance exclusive of non-cash charges and other items that are considered by management to be outside of Formula's core operating results.